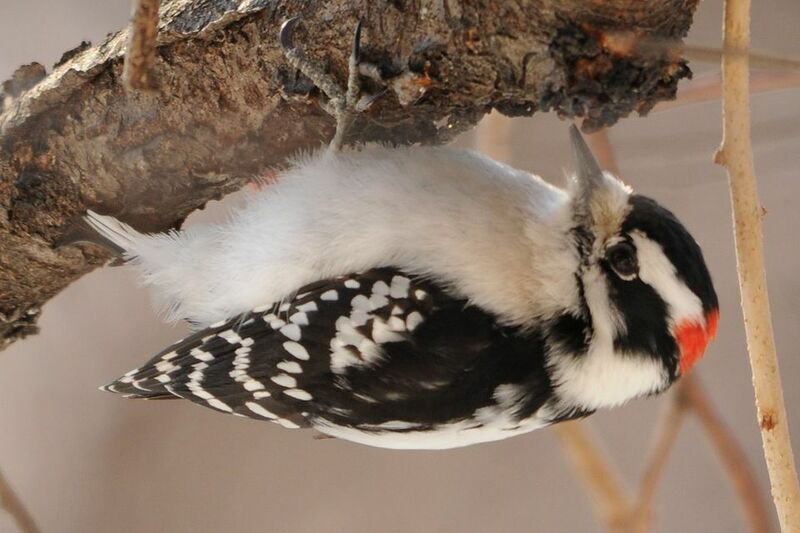 The downy woodpecker (Picoides pubescens) is the smallest North American woodpecker and can be found year-round throughout the continental United States and southern Canada. At just 6-7 inches long, these birds can be difficult to spot, but they are common in forests, urban areas, parks, and other habitats. Male and female birds look similar, but males have a bright red patch on the back of the head, while females have a black patch. Another feature to look for is the tiny, nub-like bill that is less than half the length of the bird's head. Like all woodpeckers, downy woodpeckers use their stiff tail feathers as a tripod to balance against tree trunks. This gives them added stability and strength when drumming for insects, peeling bark away to feed, or drilling nesting cavities. Their tail feathers are often pointed and the tail has a forked appearance that can be useful for identifying woodpeckers. The hairy woodpecker (Picoides villosus) is almost indistinguishable from its downy woodpecker cousin, but hairy woodpeckers are larger and their bills are longer. To tell the differences between downy woodpeckers and hairy woodpeckers, look carefully at the bill size in proportion to the head. For hairy woodpeckers, the bill is longer than half the width of the head, while for downy woodpeckers, it is shorter than half the width. Some male hairy woodpeckers have a faint wash of color along the crown of the head instead of a brighter spot at the back of the head. This can make them difficult to distinguish from three-toed woodpeckers, but hairy woodpeckers have whiter sides and a greater number of white wing spots. The bold red, white, and blue-black coloration makes the red-headed woodpecker (Melanerpes erythrocephalus) hard to miss. The white wing patches are especially prominent in flight, and the bright red color not only covers the entire head but the throat as well. Juvenile birds have dark brown heads that gradually turn red with maturity during their first winter. These woodpeckers are fairly common in the eastern United States year-round. 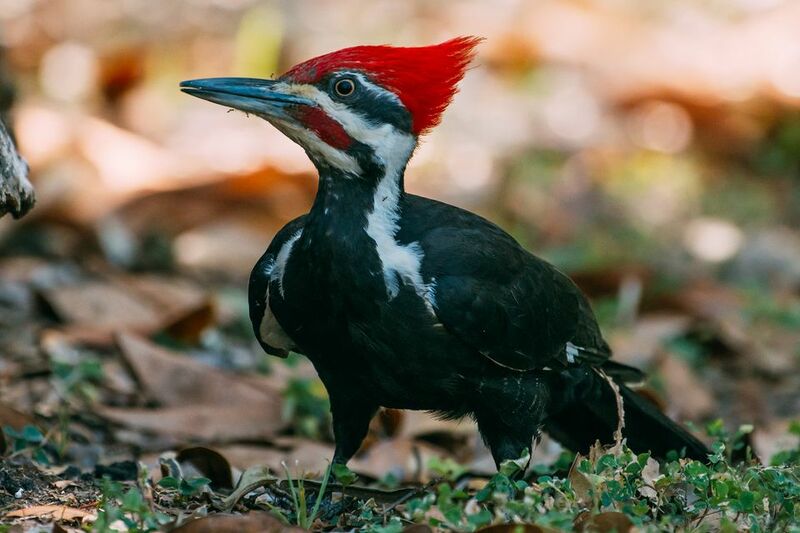 The pileated woodpecker (Dryocopus pileatus) is the largest woodpecker in North America, reaching up to 18 inches in length. These birds are easily identified by their size and their preferred habitat with large, sturdy trees that can support their exuberant drilling. While more common in the eastern United States, pileated woodpeckers can be found in many northwestern forests as well. Both male and female birds have red, moderately crested heads with bold white markings, and males also have a splash of red along their cheek stripe. Northern flickers (Colaptes auratus) are buff or tan woodpeckers commonly found feeding on ants and other insects on the ground. They are common throughout the United States and Canada, but different populations have different colors. Eastern birds usually display yellow or gold markings in the wings and under the tail during flight, while western birds have reddish or cinnamon markings. The dark bib and underpart spotting is prominent on both male and female birds, though only the male birds have the facial mustache. Red-bellied woodpeckers (Melanerpes carolinus) are often confused with northern flickers but they lack the black bib and abdomen spots, and the barring on the back is stronger. These are common birds throughout the eastern and southeastern United States, and can be found in parks, forests, urban areas, and rural habitats. While there is a slight red smudge on the lower abdomen, it can be difficult to see. Male birds have a red patch from the bill across the crown to the back of the head, while females only have red at the base of the bill and at the back of the head. All woodpeckers will eat nuts, including wild-grown acorns, hickory nuts, and beech nuts as well as peanuts offered at backyard feeders. Suet, insects, and seeds are also preferred foods, as well as grape or apple jelly, orange halves, and nectar, which woodpeckers will sip right out of hummingbird feeders. Red-bellied woodpeckers are one of the most common woodpeckers that will happily visit feeders for these treats. The ladder-backed woodpecker (Picoides scalaris) is a year-round resident of the southwestern United States and into Mexico, including the Baja peninsula. These pied woodpeckers have a reddish crown on males, though females lack any colors other than black, white, gray, and buff. The upperparts are barred, while the underparts are spotted. The undertail coverts are also barred, but are more white than black, and the tail is solid black. Sapsuckers come in several species, but the yellow-bellied sapsucker (Sphyrapicus varius) is most common in the eastern United States and Canada. A migratory bird, yellow-bellied sapsuckers breed in southern Canada but spend winters in the southeastern United States, including eastern Texas and along the eastern coast of Mexico. The bold white wing bars, thick red, black, and white facial markings, and yellow wash along the sides, back, and abdomen make this one of the most colorful woodpeckers. The clown-like facial pattern of the acorn woodpecker (Melanerpes formicivorus) is instantly recognizable for both males and females, though females have a black forehead while males have a white forehead. These birds are well-known for their healthy appetite for acorns, and they will create granary trees to store thousands and thousands of nuts. These birds can be found year-round along the Pacific coast from Oregon to southern California, and they are also widespread through central Arizona and New Mexico, with their range extending into Mexico.